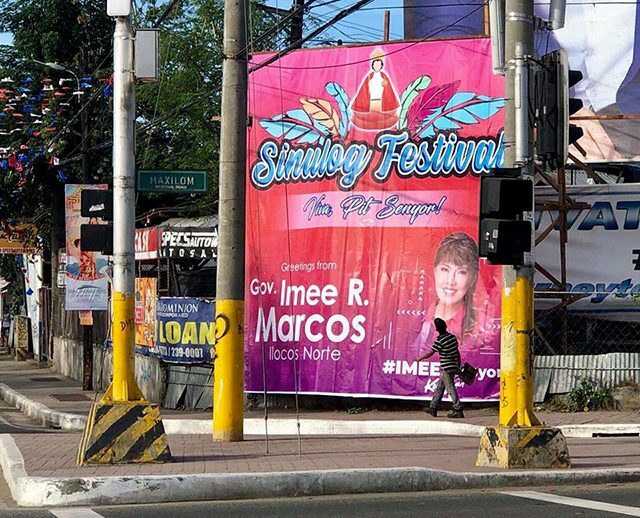 Cebu City Mayor Tomas Osmeña ordered the removal of tarpaulins of political candidates in the upcoming midterm elections including that of Ilocos Norte Governor Imee Marcos. Political tarpaulins, TV advertisements and other campaign paraphernalia are already prevalent even though the campaign period has not yet started. The official start date is February 12. Osmeña reminded candidates early on January 18 that there should be no campaigning during the annual Sinulog Festival as it is a religious event. “National candidates like anyone else are welcome to join in the celebration, but they will not be speaking nor will they be grandstanding on stage,” he said. One of the posters that was taken down is from Marcos. Osmeña attached a photo of it in a separate post. 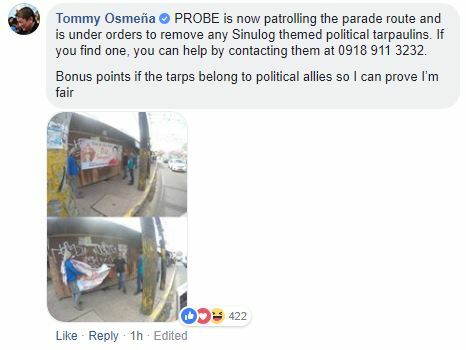 To prove this, the mayor also posted snapshots of his PROBE team looking for posters in the guise of a Sinulog greeting. Event organizers have similarly requested politicians who wish to attend the celebrations to not conduct political or campaign speeches. Information officer Malou Innocando-Tabar said that only President Rodrigo Duterte is allowed to make a speech. The Commission on Elections has recognized that there’s a loophole in the election rules covering pre-campaigning. The Fair Election Act and the Omnibus Election Code does not include any provisions that penalize political aspirants who campaign before the official start of the election period. As early as April 2018, names of public figures seeking elective posts have been seen on many items from ballers, graduation greetings to shirts. According to Election Officer Gregorio Bonifacio, these could not be counted as early campaigning even during that time because these prospective candidates have yet to file their certificates of candidacy. So far, personalities who have aired their TV advertisements include former presidential aide Bong Go, Mar Roxas, Davao City Mayor Sara Duterte and Marcos. The Senate Committee on Electoral Reforms and People’s Participation approved Senate Bill 2064 in 2018 that seeks to amend Section 15 of the Automated Election Law wherein the provision on prohibiting premature campaigning is added.